In established physics / chemistry / science it is assumed that the modulus of the energy which is required to split a water molecule (electrolytically) into hydrogen and oxygen is always equal to the modulus of the energy which is released when hydrogen and oxygen recombine into a water molecule. This is because the two hydrogen atoms and the one oxygen atom in a water molecule are bound together by electric or electromagnetic forces which are considered as so-called conservative force fields, i.e. a closed loop motion of a particle in such a force field can never result in a gain of usable energy. However, many researchers and inventors have claimed that under specific conditions it is possible to split water into hydrogen and oxygen with much less energy than usual. In this case usable energy can be generated when the created hydrogen and oxygen recombine into water with a release of the usual amount of energy. Economical hydrogen production by electrolysis using nano pulsed DC C. H. Dharmaraj and S. AdishKumar International Journal of Energy and Environment Volume 3 (Issue 1), 2012, pages 129 - 136 https://www.ijee.ieefoundation.org/vol3/issue1/IJEE_13_v3n1.pdf or open or download this paper as pdf from this website. The authors of this paper have not considered or speculated what could be physically behind this remarkable phenomenon. The author of this website assumes that any physical process can be performed / modified / designed in such a way that it taps an everywhere present and hitherto unexplored energy source which is called space energy, vacuum energy, ether energy, or space-time energy. For further information about it we refer to an information document about entirely novel and environmentally energy technologies. From this perspective it is assumed that a specifically pulsed electrolysis results somehow in an assisted water splitting where a large part of the required splitting energy is provided by an usable inflow of space / vacuum / ether / space-time energy. German-language report about the German-language congress "Bahnbrechende Energietechnologien" about novel energy technologies and related topics in Königstein nearby Frankfurt in Germany on 29 and 30 September 2018: http://www.borderlands.de/net_pdf/NET1118S10-23.pdf . To be published in the November / December 2018 issue of the NET Journal (ISSN 1420-9292) (in German). 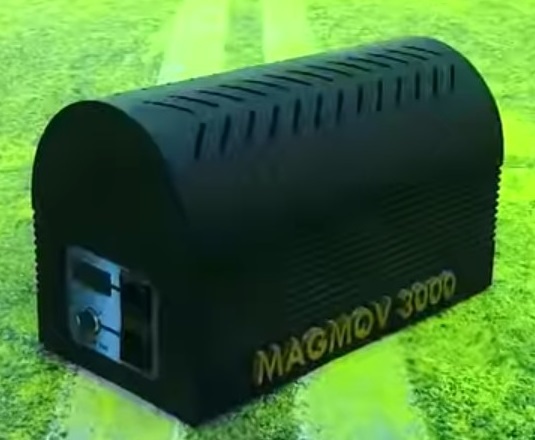 Self-running and zero emission 3 kW generators from the company Magmov in Georgia - Are they credible and genuine ? The company Magmov is not able to handle all purchase orders alone and they are looking for partners in various countries concerning series production and marketing. It was / is intended to establish a manufacturing of these generators in various countries. To demonstrate these generators several events were planned in various countries, among others also in Switzerland. The Swiss event was originally planned for 20 May 2017. It was then two times postponed and later cancelled because it did appear uncertain if a working generator becomes really available. In June 2017 the author of this website attended a meeting where the current status of the Magmov project was discussed. Furthermore, the author of this website attended a conference about entirely novel energy technologies and related topics which took place from 29 September 2017 to 1 October 2017 in Graz in Austria. The planned conference program from 27 September 2017 is available here in English and in German . On 1 October 2017 it was scheduled that the inventor Daniel Yousseffi from the company Magmov presents a working 3 kW generator. Actually, Daniel Youseffi was on 1 October 2017 there and gave a talk, however he did not present a working generator. The assessment of the author of this website from the two above-mentioned events is the following: The inventor Daniel Youseffi from the company Magmov was so far not able to show a working generator. Questions were often not or not properly answered. Details of the concept, pictures of an assembled and functioning generator, and measured data were not shown. It is still an open question whether the concept really works. So far there is no comprehensible proof that already payed and allegedly produced and shipped generators were really produced and shipped. Therefore it is inappropriate that the company Magmov shows and offers their generator (already now) in their website. Congress about entirely novel energy technologies and related topics in Graz in Austria from 29 September to 1 October 2017. The planned conference program from 27 September 2017 is available here in English and in German . Conference language is German and English with simultaneous translation. Among others, it is intended to demonstrate a self-running and zero emission 7 kW generator from the company Innova Tehno. 17 May 2015 - 22 April 2015 Entirely novel and environmentally friendly energy technologies – A serial prototype of an autonomously running 5 kW power plant from the company Rosch Innovations and the Austrian association GAIA is completed, tested, and released for public viewing and inspection from 25 April to 6 May 2015 at a Rosch site nearby Cologne in Germany. This self-running and zero-emission power plant with an usable output power of 4,8 kW can be ordered and will be produced in limited numbers if a specific number of purchase orders is reached. The company Rosch Innovations / Save The Planet AG has developed so-called kinetic or buoyancy power plants which are self-running, i.e.they generate permanently usable electric energy without any fuels, wind power or solar energy. These zero-emission power plants consist of a control unit, an electric generator, an electrically-operated compressor which produces compressed air, a water column which contains a chain drive, fillable containers which are attached at the chain drive, and a valve system which can fill the containers with air. A pilot plant was developed and is located at the research and development (R&D) laboratory of Rosch in Belgrade in Serbia. Several scientists who are working at the Rosch R&D lab have previously worked in military research projects. The pilot plant at the Rosch R&D lab requires an electric input power of about 1,5 kW and generates an electric output power of about 11 kW. A report in English or German about this pilot plant is available in the website of Rosch AfrAsia . 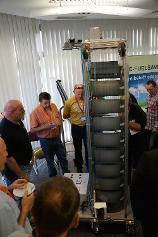 A self-running demonstration model with approximate dimensions 60 × 60 × 230 cm was presented at a congress about entirely novel energy technologies in Bregenz in Austria on 18 October 2014 [2,3,4,5]. The casing for the water column and the chain drive is made of acrylic glass. After a short initial supply of electric power from a battery the demonstration model started its self-running operation. The electric generator produced electricity not only for electrical loads but also for the electrically-operated system components such as the compressor and control unit. The demonstration model did generate an electric power of a few hundred watts for about two hours. The author of this website has viewed the self-running demonstration model at the congress in Bregenz. After about two hours operation the demonstration model was switched off and prepared for removal. 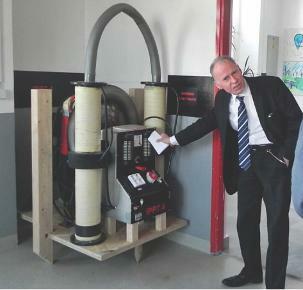 The Austrian association GAIA offers in cooperation with Rosch a power plant for houses. Its output power and device height is about 5 kW and about 5 m, respectively. Rosch produces and delivers the components. 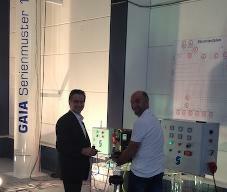 In April 2015 GAIA has announced that a self-running 5 kW serial prototype (GAIA Serienmuster No. 1) is completed, tested, and released for public viewing and inspection at a Rosch site in Troisdorf-Spich nearby Cologne in Germany. In April 2015 GAIA has announced viewing dates in the period from 25 April 2015 to 6 May 2015. Professional electricians can inspect the pilot plant on 6 May 2015. Registration is possible via the GAIA website (mainly in German). The viewing events take place under strict security conditions including a video recording which is streamed into the internet. Comments, updates and pictures about / from the viewing events and the running serial prototype are periodically posted in the GAIA website . The author of this website has attended two events at the Rosch site in Troisdorf-Spich, a ordinary viewing event on 1 May 2015 and a special event on 13 May 2015 where the serial prototype was switched off and disassembled. Also the event on 13 May 2015 was recorded by video and streamed into the internet. The serial prototype consists of a steel tube, an electrically operated compressor, an electrical generator and a control unit. The steel tube contains the chain drive, fillable containers which are attached at the chain drive, a valve system which can fill the containers with air, and water. The height and diameter of the steel tube is about 4,3 m and about 45 cm, respectively. Located at the top of the steel tube is the compressor, a gear and the generator which generates three-phase electric power with a voltage of about 400 V. The weight of the complete system without water is about 300 kg. The steel tube is fixed at the ground and laterally at the wall. This fixation prevents an overturning of the heavy steel tube in case of a malfunction of the chain drive. The total height of the overall system is about 5 m including space for a lifting device for maintenance. The generator produces electricity also for the compressor and the control unit and the usable electric output power is 4,8 kW. Several powerful lamps and infrared heaters serve as electrical loads with a total power of 4,8 kW. Apart from a few short interruptions the serial prototype is running autonomously day and night since 20 April 2015. On 5 May 2015 it has generated an electrical energy of more than 1500 kWh. This 5 kW power plant can be ordered via the GAIA website (presently only in German) and will be produced in limited numbers if a specific number of purchase orders is reached. 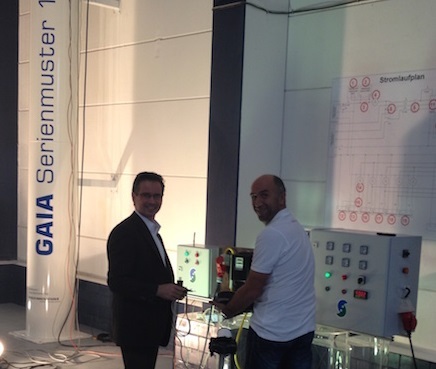 The offered procedure implies an assembling of the power plant by the customer and staff members from GAIA. The components will be delivered by Rosch and several customers and GAIA staff members will assemble several power plants at one location. Subsequently each power plant will be transported to its destination. In this case the price of the power plant is about 14000 EUR plus country-specific sales tax, transportation costs, and possibly custom dues. Another possibility is the delivery and installation of a turnkey system. In this case the price of the power plant is of the order of 25000 EUR. A worldwide delivery and installation is possible. The transport of the power plant requires a truck which is equipped with a crane. 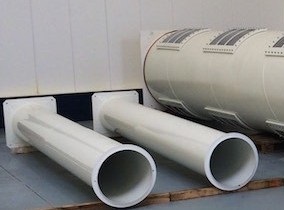 The power plant can be installed overground or it can be positioned partly or completely underground within a duct. The electrical connection to the in-house grid has to be implemented by a professional electrician. A rectifier and an inverter will be installed between the generator and the in-house grid. That ensures a stable frequency of the alternating current in case of load changes. The expected operational life span of the 5 kW power plant is about 25 years. The company Rosch Innovations offers and produces mainly industrial size power plants with an electric output power of 200 kW - 100 MW. A self-running pilot plant with an electric output power of 100 kW is currently under construction at the Rosch site in Troisdorf-Spich nearby Cologne in Germany. The Rosch site in Troisdorf-Spich comprises a reception, offices and large halls for the manufacture of prototypes and demonstration models. Another Rosch sites are located in Neueibau in East Germany, Amriswil in Switzerland, Serbia, Croatia, and South Africa. The industrial size power plants are also marketed by the German distribution partner E-Cat Deutschland GmbH . The company Rosch AfrAsia cares about the marketing in Africa and Asia. The English-language website of Rosch AfrAsia comprises many information about the Rosch power plants. the demonstration model which was shown on 14 October 2014 in Bregenz was switched off after about 2 hours and prepared for removal. One can rise the question if the system did really run autonomously. Perhaps it did run for 2 hours by batteries which were placed in the control cabinet. is it absolutely certain that the 5 kW serial prototype did run autonomously ? Perhaps it was somehow provided with electric power. why was the livestream between 6 and 13 May 2015 occasionally interrupted ? On the one hand it is very important to ask critical questions and certainly there is room for improvement. On the other hand it is also vital to appreciate the work of the GAIA and Rosch staff members and what they have achieved, assuming that the Rosch power plants are real and not a fraud. That what has been achieved so far is the result of talks and negotiations between GAIA and Rosch. The intention of the association GAIA is the dissemination of novel and environmentally friendly energy technologies among the people and it should be emphasized that the work of GAIA is mainly funded by donations. Rosch is a company with economic interests and they want to protect their company secrets. Therefore the 5 kW power plant project implies some conditions and compromises. For Rosch this is not a big deal because their focus are industrial-size power plants which are more economic than small systems. The author of this website does not agree with everything what was said or done by Rosch and GAIA (staff members). Nevertheless, the author of this website still assumes that the Rosch kinetic power plants are real. If it should turn out later that they are a fraud, then the author of this website will admit "I was wrong". If the Rosch kinetic power plants were a fraud, why then all the effort to have staff members, buildings, offices, several sites, large halls, facilities, devices etc. ? Just to collect money in order to abscond abroad subsequently ? That appears rather unlikely. Furthermore, Rosch and GAIA (staff members) have received many threats and did experience several criminal acts. For example, they were prompted to cancel the viewing events and burglaries took place. Why all this if the power plants are not real ? The power plants utilize the gravitational field of the earth and magnetic and electric fields in the electric generator. In established physics or mainstream science the gravitational, electric and magnetic fields are termed as so-called conservative force fields. This means that a motion in a closed loop does not lead to a gain of energy. Meanwhile, however, we can start from the premise that there are various devices which allow a self-running motion where a movement in a closed loop does result in a gain of energy [7,8]. Such devices are so far not considered within the framework of established physics or mainstream science because it is assumed that they are impossible. Devising a self-running construction or process requires a thinking out of the box. It comprises a consideration of existing forces and their appropriate consolidation. For that it is not necessary to know the origin of the generated energy. Nevertheless, it is of course an interesting question from where the generated energy comes from. The author of this website assumes that self-running devices like the kinetic power plants from Rosch imply at the subatomic level an extraction of usable energy from the everywhere present space or vacuum energy via the earth`s gravitational field and / or electromagnetic fields . Here the "via" is emphasized because this is not the same as an extraction of usable energy from the earth`s gravitational field and / or electromagnetic fields. 21 February 2015 Entirely novel energy technologies – About the self-running magnet motor of the Turkish inventor Muammer Yildiz. This magnet motor comprises a special array of permanent magnets and a self-running prototype was presented at the Eindhoven University of Technology / Netherlands in April 2009 and at the University of Delft / Netherlands in May 2010: https://www.youtube.com/watch?v=mHW6b1aFPfU . Two papers "Introducing the Yildiz Motor" and "Modeling the Yildiz Motor" by Dr. J. L. Duarte from the Department of Electrical Engineeering of the Eindhoven University of Technology / Netherlands: http://novam-research.com/resources/Introducing-and-modeling-the-Yildiz-Motor_v01.pdf . Website about the Yildiz Magnet Motor: www.bsmhturk.com . Report in the May / June 2010 issue of the NET-Journal (in German): http://www.borderlands.de/net_pdf/NET0510S21-26.pdf . The Yildiz Magnet Motor was also presented at 41th inventor fair in Geneva / Switzerland, see a report on page 12 in the May / June 2013 issue of the NET-Journal (in German): http://www.borderlands.de/net_pdf/NET0513S4-14.pdf . The author of the website considers the Yildiz Magnet Motor as a further example / evidence of novel energy technologies which tap via magnetic fields a hitherto unexplored form of energy and assumes that this is an everywhere present form of energy which is called space energy, vacuum energy, zero point energy, ether energy, or space-time energy. 19 February 2015 Entirely novel energy technologies – The Spanish company Platinum Invests Group has developed an autonomously running mechanical and electromagnetic system that generates usable electric energy up to 20 kW: http://platinum-invests.eu/palladium-green-energy/?lang=en . The market introduction is scheduled for 2015. For further information - partly in English and partly in German - see the following cleared text / link: http://borderlands.de/Links/Platinum-Invest.pdf . The author of this website considers this system as a further example or evidence of novel energy technologies which tap via (electro)magnetic fields a hitherto unexplored form of energy and assumes that this is an everywhere present form of energy which is called space energy, vacuum energy, zero point energy, ether energy, or space-time energy. 8 February 2015 Superconductivity – New version of the presentation Searching for Room Temperature Superconductors (107 pages, file size about 5 MB pdf). It comprises also a modified and extended section about Global Scaling. 10 January 2015 Entirely novel energy technologies – The Swiss newspaper "Aargauer Zeitung" reports in December 2014 about a novel energy technology (in German): www.aargauerzeitung.ch/aargau/zurzach/energie-revolution-dieser-zurzibieter-erzeugt-aus-warmem-wasser-energie-128632204 . The Swiss eye doctor Nikolaus Vida has developed a fast thermal and magnetic switch. By using cool and warm water with a temperature difference of 20 °C the magnetic state of a magnetic material can be via its Curie point switched on and off within 4 milliseconds. This is 1000 times faster than the switching time of established switches and allows the construction of an effective rotating magnetic device whose torque can generate electricity. The development of pilot plants takes place in cooperation with the Swiss University of Applied Sciences "Fachhochschule Nordwestschweiz" (project manager Daniel Wymann). The present pilot plant shows a speed of rotation of 200 rpm and generates an electric power of 3 kW. The next pilot plant shall generate 50 kW. 26 November 2014 Ultraconductors – Superconducting or superconductor-like polymer materials: Information in the website of the Aesop Institute: www.aesopinstitute.org/ultraconductors.html . The following reports have been cleared for public release and can be downloaded from this website: Report 1 from 1995 (600 kB pdf), Report 2 from 1996 (900 kB pdf), Report 3 from 1998 (800 kB pdf) and Report 4 from 1999 (4 MB pdf). Many thanks to Mark Goldes from the Aesop Institute for providing these reports. 22 April 2014 Video from The Resonance Project Foundation / Nassim Haramein about the importance and power of spin: http://www.youtube.com/watch?v=QJOBnoqk_0Q . The basic idea is that the space-time or vacuum itself comprises a spin / torque / angular momentum. Probably this feature plays an important role for entirely novel energy technologies which extract usable energy from space-time or vacuum. Also the so-called ECE-Theory implies something similar (it is called torsion of space-time) and predicts the possibility of extracting usable energy from space-time. 20 April 2014 This website is up again. It was down and not accessible from 16 - 20 April 2014. 6 February 2014 Institute of Venture Science – A proposal for implementation by Prof. G. H. Pollack http://faculty.washington.edu/ghp/uploads/IVS%20details%202012.pdf . Many thanks to Charles Fraser, co-founder and president of The Foundation for Common Good , for calling attention to this proposal. 2 January 2014 Entirely novel energy technologies – The website of the Swiss Association for Space Energy (SVR) comprises in the section "Infobereich" many interesting information and some of them were recently updated (in German): http://www.svrswiss.org and then click on the button "Infobereich". Many thanks to Adolf and Inge Schneider for providing and updating these information. 29 December 2013 Superconductivity – The organic compound picene, a semiconducting hydrocarbon, becomes superconducting at 18 K when it is doped with potassium: http://www.okayama-u.ac.jp/user/kouhou/ebulletin/feature/vol5/feature_001.html . Many thanks to Adolf Schneider for the communication of this news. 3 August 2013 Physics – Coupled particles cross energy wall via so-called Klein Tunneling: http://www.sciencedaily.com/releases/2013/05/130529092204.htm . Many thanks to Adolf Schneider for the communication of this topic. 2 August 2013 Entirely novel energy technologies – Website of the Swiss company ROSCH Innovations AG: http://www.rosch.ag . Many thanks to Ulrich Sackstedt for the communication of this website. 3 May 2013 Physics and zero point energy – Recent research results concerning the motion of ring-like pyrrole molecules on a metal surface indicate that the zero point energy can become significant on the molecular level: http://phys.org/news/2013-04-movement-pyrrole-molecules-defy-classical.html#jCp . Many thanks to Adolf Schneider for the communication of this issue. 5 August 2012 Entirely novel energy technologies – 17th International Conference on Cold Fusion from 12 - 17 August 2012 in Daejeon / Korea: http://www.iccf17.org/ . Many thanks to Felix Scholkmann for the communication of this conference. Catalyst Induced Hydrino Transition (CIHT) Cell from the company Blacklight Power: http://www.blacklightpower.com/ . This electrochemical cell generates electric energy from water vapor via novel electronic transitions in hydrogen atoms. EBM technology (electromagnetic generators for power plants) from the company Gammamanager: http://www.youtube.com/watch?v=-6MDHF39XmU&feature=player_embedded and http://www.gammamanager.com/ . Large generators with a power in the MW range can be ordered. ECAT – Cold fusion or low energy nuclear reactors which generate a large amount of heat when very small amounts of hydrogen and nickel are combined: http://ecat.com/ . 1 MW power plants which provide heat energy can be ordered and 10 kW home units can be pre-ordered. Fostac Technologies AG (a company in Switzerland): http://www.fostac-technologies.ch/ . They offer a commercially available electric energy technology which is called Fostac Maximus. Information document for the general public, experts, laymen, decision makers, VIPs, and wealthy personalities: http://www.novam-research.com/resources/information-document.pdf . On page 12 and 13 there is a brief model consideration about the extraction of usable energy from the everywhere present vacuum / space / space-time / zero point energy. http://technologygateway.nasa.gov/media/CC/lenr/lenr.html . Probably this official NASA statement was triggered by the recent commercial rollout of the ECAT power plants which are likewise based on LENR. Until recently NASA was one of many institutions which officially denied the existence or feasibility of such technologies. Plasma generators from the Keshe Foundation which provide electric power: http://www.keshefoundation.org/en/shop/product/view/2/3 . This link also provides application and reservation forms for portable AC / DC generators with a maximum power of 3 - 4 kW or 10 kW for domestic use. Report "Luftverkehr mit Freie-Energie-Technologien - Realität oder Science Fiction?" from an internal EADS technology meeting on 21 March 2011 about unconventional energy and propulsion technologies, published in the "NET-Journal" / issue "März & April 2011" / pages 25 - 32 (in German): http://www.borderlands.de/net_pdf/NET0311S25-32.pdf . Invited external speakers were Dipl. Ing. A. Schneider and Prof. C. W. Turtur. 31 July 2012 Biophysics – Interdisciplinary and international conference on the Fields of the Cell in Basel / Switzerland on 6 and 7 October 2012: http://www.fieldsofthecell2012.com/ . Many thanks to Felix Scholkmann for the communication of this conference. Entirely novel energy and propulsion technologies – Report about an internal EADS technology meeting on 21 March 2011 about unconventional energy and propulsion technologies, published in the "NET-Journal", issue "Maerz / April 2011", pages 25 - 32 (in German): http://www.borderlands.de/net_pdf/NET0311S25-32.pdf . Invited external speakers were Dipl. Ing. Adolf Schneider and Prof. Claus Turtur. Some interesting information about the so-called Keppe Motor and its underlying (meta)physics: The following are some notes from the presentation given by the co-inventors C. Soos and R. Frascari at the Congress "Autonome Energiesysteme" in Schloss Hofen / Austria on 4 September 2010: – The Keppe Motor is a novel and highly efficient electric motor which is driven by a pulsed DC current. It displays the unusual feature that its operation is not accompanied by the production of heat. Furthermore, by means of specific modifications the Keppe Motor is able to run without any input power. This mode of operation is based on the extraction of usable energy from the space energy. – About the concepts or new physics of N. R. Keppe: – Matter is created by a resonance of space energy. In Keppe's terminology the space energy is called essential energy. The essential energy is constituted of two components, attraction and repulsion. Atoms are considered as vortices. – If electricity is generated by moving or rotating magnets or by electrochemical batteries, then this corresponds only to one component of the essential energy. This is the cause of the low efficiency and heat losses (entropy) in conventional electric systems. – From the perspective of the essential energy the common AC current does not represent a real alternating current. Both AC and DC correspond only to one direction or component of the essential energy. The "real" AC current is found in a pulsed DC current which comprises two components of the essential energy, namely action and complementation (instead of action and reaction). The Keppe Motor taps the essential energy by a pulsed DC current. – The essential energy represents an organizing energy which forms and keeps the universe on all levels. Therefore the Keppe Motor can result in beneficial effects on the health of (human) beings. – Two further statements: – The essential energy permits the creation of longitudinal electromagnetic waves (which are also called scalar waves). – The concept of "internal vibration" of the essential energy complements the concept of frequency. Entirely novel energy technologies: On 1 May 2010 the author of this website attended a meeting in Germany where an entirely novel energy technology was presented. This fundamentally new technology taps the so-called and everywhere present space energy, vacuum energy, zero point energy or free energy. Presented was an autonomously running device which generated an usable mechanical and electric power of some Watts. This device is the result from 22 years research and development and rests upon unconventional physical effects which are so far unexplored by the established science. The next intended step is the creation of prototypes with a significantly higher power output. According to the inventors the device is scalable up to a power output of about 10 kW and its design is suitable for mass production. To the best of the author’s knowledge and belief, the organizers of the meeting (who are personally known to the author since many years), the attendant inventor, the device and the presentation did appear convincing, authentic and credible. – Note: Nowadays we can proceed from the assumption that there are novel and environmentally friendly energy technologies which are based on an extraction of energy from space-time or quantum vacuum. This kind of energy is present in huge amounts at every location and is called space energy, vacuum energy, zero point energy or free energy. Energy technologies which tap this kind of energy do not need any fuels, are emission-free and provide usable energy at any place and any time. They have the potential to replace all conventional energy conversion devices such as combustion engines, nuclear power plants, hydroelectric energy and solar power. 8 July 2012 Extended Electrodynamics – Paper "Toward a more complete electrodynamic theory" published by L. M. Hilvely and G. C. Giakos in the International Journal of Signal and Imaging Systems Engineering / Volume 5 / pages 3 - 10 / 2012 : http://www.inderscience.com/offer.php?id=46745 . Some keywords: Maxwell equations, gauge conditions, charge-fluctuation-driven scalar waves with energy but without momentum, longitudinal electric waves, and experimental suggestions. Many thanks to Felix Scholkmann for the communication of this paper. 21 January 2012 Entirely novel energy technologies – Official statement from NASA that there are novel and environmentally friendly energy technologies which are based on low energy nuclear reactions (LENR), also called cold fusion (2 minutes video): http://technologygateway.nasa.gov/media/CC/lenr/lenr.html . Most probably this official NASA statement was triggered by the recent commercial rollout of the ECAT power plants which are likewise based on LENR or cold fusion. Until recently NASA was one of many institutions who officially denied the existence or feasibility of such technologies and now NASA attempts to develop an own LENR or cold fusion technology. 17 October 2011 Superconductivity – Paper "Superconductivity and a condensate of ordered zero-point oscillations" by B. V. Vasiliev, published in arxiv.org as paper "arXiv:1009.2293v5 [physics.gen-ph] 13 October 2011": http://arxiv.org/PS_cache/arxiv/pdf/1009/1009.2293v5.pdf . See also http://arxiv.org/abs/1009.2293 and paper published in Physica C 471 (2011) 277. Abstract: The phenomenon of superconductivity is considered as a result of an ordering of zero-point oscillations in a system of collectivized electrons. On this way, a satisfactory agreement of calculated estimations with the measured data can be obtained for both - type-I and type-II superconductors. The density of superconducting carriers and the critical temperature of the superconductor are determined by the peculiarities of the interaction of the zero-point oscillations, and the critical magnetic field of a superconductor is defined by a mechanism of the destruction of the coherence of zero-point oscillations. The evaluations show that the critical parameters of superconductors are depending on the Sommerfeld constant (or the Fermi-energy) and does not depend on the electron-phonon interaction. It is marked that among the high-temperature superconducting ceramics there are the both - I and II - types superconductors. It is shown that the temperature dependence of the value of energy gap in superconductors is characteristic for the order-disorder transition. The corrected expression for the London penetration depth is obtained. It is supposed that the phenomenon of superfluidity can be considered also as a consequence of the zero-point oscillation ordering. – Many thanks to Felix Scholkmann for the communication of this paper and link.